Elmstone Court is an elegant Grade II listed Georgian country house, set in the lovely rural countryside of the small village of Preston, near Canterbury, Kent, and Fig 1 looks across the stream to the back lawn of the house. The inclusion of its garden in this series of essays on Pulham gardens came about by pure accident, because it was not included in any listing of Pulham gardens at the time my book, Rock Landscapes: The Pulham Legacy, was published. Our knowledge of its existence is due to Martyn Cox, Gardening Correspondent of The Daily Mail, who wrote an article about it in the paper in October 2012, soon after its present owner, Patricia Simpson, put the property up for sale some time after the death of her husband, John. 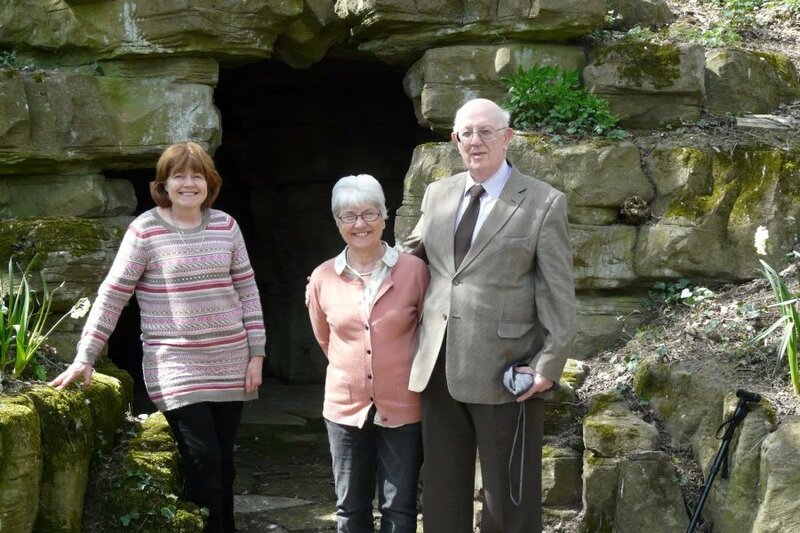 They had lived at Elmstone Court for about ten years, during which time they had worked tirelessly on the restoration of their garden, which included a unique rock feature that can only have been constructed by James Pulham and Son. During the early 1900s, Elmstone Court was the home of Cordell William Firebrace, a Captain in the services of the 7th Hussars cavalry regiment; a JP, and a Fellow of the Society of Antiquaries (FSA). [i] He was apparently also very fond of his garden, because, in 1909, he engaged the Pulhams to construct some charming rock features – including a grotto, rustic pathway, and a bridge – in the western corner of his four-acre grounds. When the Simpsons moved into the house in 2002, the gardens were in a very neglected state, but they set to work clearing away the overgrowth and leaf litter under which it was concealed, and eventually brought this wonderful treasure back to life. 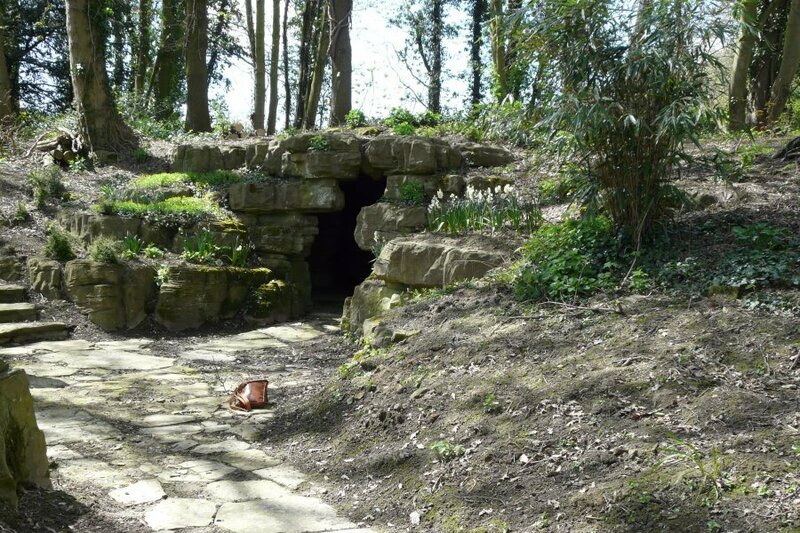 From the house, this part of the garden is approached via what used to be the kitchen garden, and across what also used to be a tennis court, to a pathway that leads to quite an impressive-sized grotto, pictured in Fig 2. 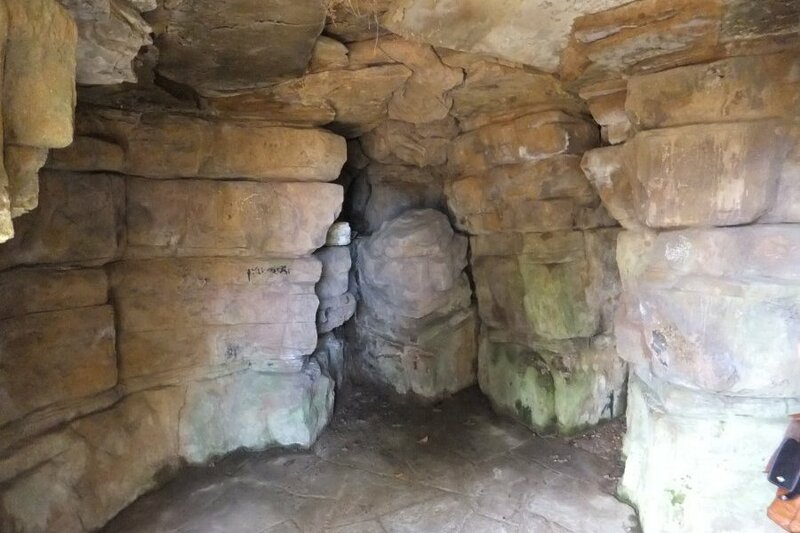 Fig 3 shows the interior of the cave, together with its niches for placing candles, of required, and Fig 4 shows Val Christman, Patricia and myself at its entrance. 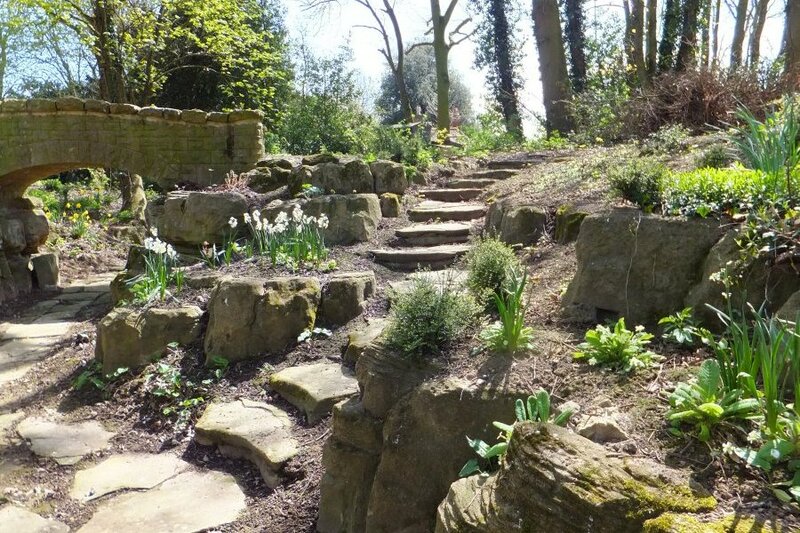 Looking back from the entrance to the grotto, a flight of rustic stone steps leads up to the top level of the garden on the right, whilst ahead lies a long Yorkstone path that leads under a small bridge, as shown in Fig 5. All of these features are unmistakeably the work of a Pulham craftsman. 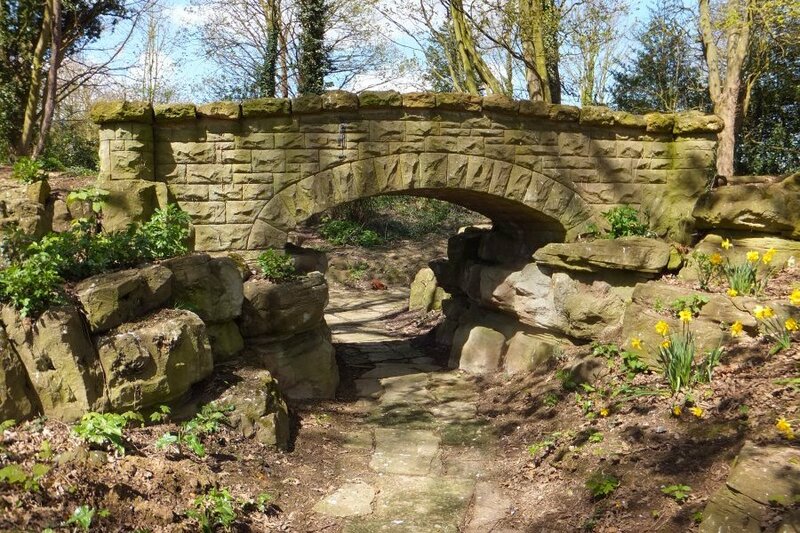 There are more rocks and planting pockets under the bridge itself (Fig 6), but an interesting point here is a panel with a shield placed on it, inscribed with Cordell William’s initials; the Firebrace family crest, and the date on which the bridge – and, presumably, the rest of this part of the garden – was built. Fig 8 looks back down the path from the other side of the bridge. This garden is a charming feature, and an invaluable addition to our legacy of Pulham sites, but there may also be a strange personal link here. 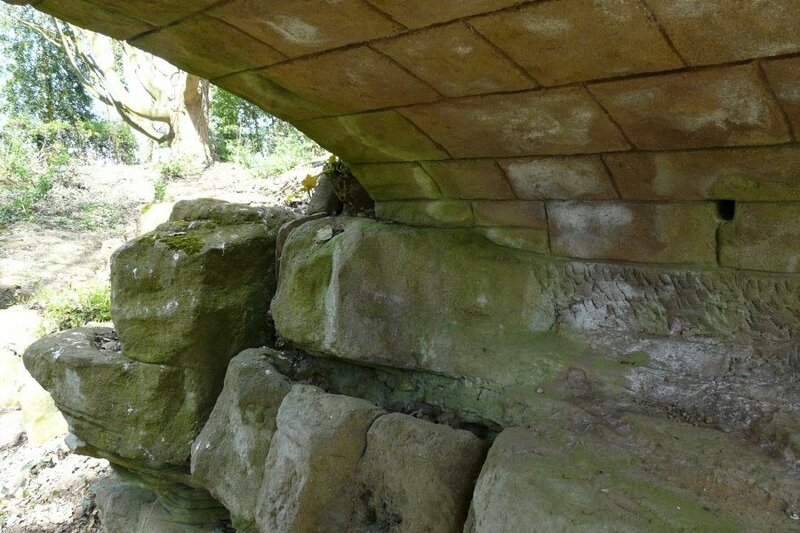 The Elmstone bridge is almost identical in style – albeit on a smaller scale – to those that link the rock garden on ‘The Mound’ at Buckingham Palace to the island in the lake, as can be seen in Fig 30.3 in my book. I know that my grandfather, Fred Hitching, was responsible for those gardens, and – whilst I have no proof of this – the general style of the rock garden at Elmstone Court makes me wonder if that might also have been his work. The additional clue that really triggered this in my mind was the inscribed shield, shown in Fig 7. This was dated 1909, and it could have been from Elmstone Court that Fred then went on to build the wonderful rock gardens for Mr Walter Melville Wills, the tobacco magnate, at Rayne Thatch, in Bristol, as discussed and illustrated in Chapter 31 of the book. That garden was completed in 1910, and it contains what I had until now considered to be a completely unique inscription stone, pictured in Fig 31.11. That one is cut by hand, and says ‘F.H. 1910’, thus marking the date on which Fred Hitching signed off on that project. To my knowledge, that is the only job on which he ever did that, so could it be that his inspiration came from installing the plaque at Elmstone Court? 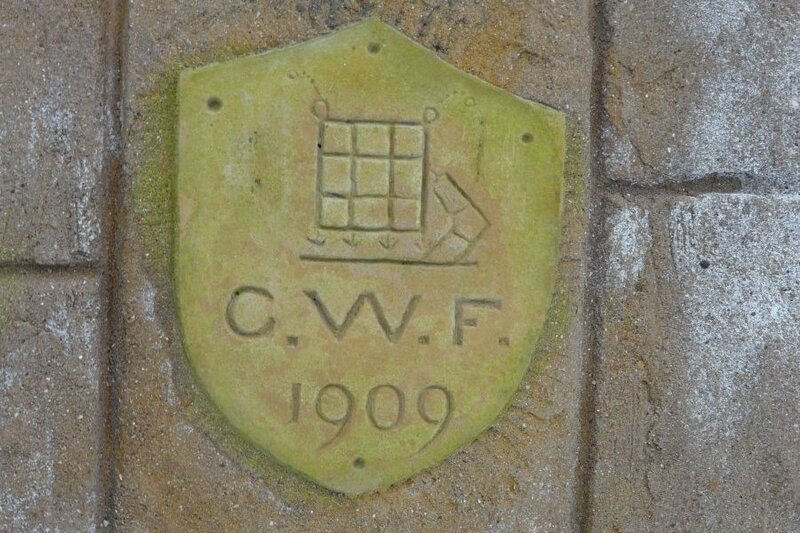 I shall never know to that, but it is an intriguing idea. . . .
Posted on May 22, 2013 June 4, 2016 by Claude HitchingPosted in Sites Month 2Tagged . . James Pulham and Son, bridge, coat of arms, Cordell William Firebrace, Elmstone Court, Fred Hitching, grotto.